Gorgeous sash with high quality, genuine crystal rhinestones by hand sewn and ironed onto white, Ivory,navy, tiffany blue or black satin ribbon. Beautiful sash for the bride,bridesmaid, holidays, or special occasion. Very sparkle diamants decoration on your wedding dresses,evening dresses. Rhinestone embellishment measures approximately 0.78" x 17"~18". Sash is 0.75" wide and approximately 98" long, made to tie a bow in the back. 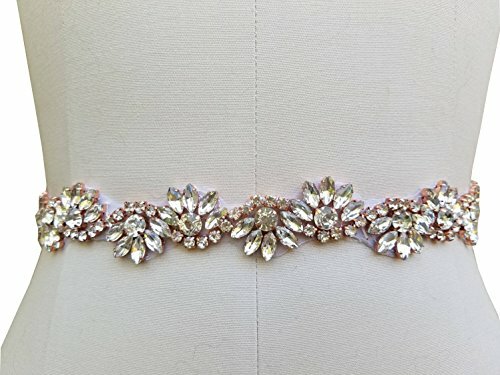 Gorgeous sash with high quality rhinestones and crystals by handmade sewing and ironing. Rhinestone embellishment measures approximately 0.78" x 17"~18" in fashion silver/gold/rose gold base design. Sash is 0.74" wide and approximately 98" long, made to tie a bow in the back. This is dazzling vintage inspired bridal sash for the bride, holidays, or special occasion. Good quality satin ribbon, elegant and lovely design that sparkles beautifully. Very pretty in person. If you have any questions about this product by KIMAXBridal, contact us by completing and submitting the form below. If you are looking for a specif part number, please include it with your message.